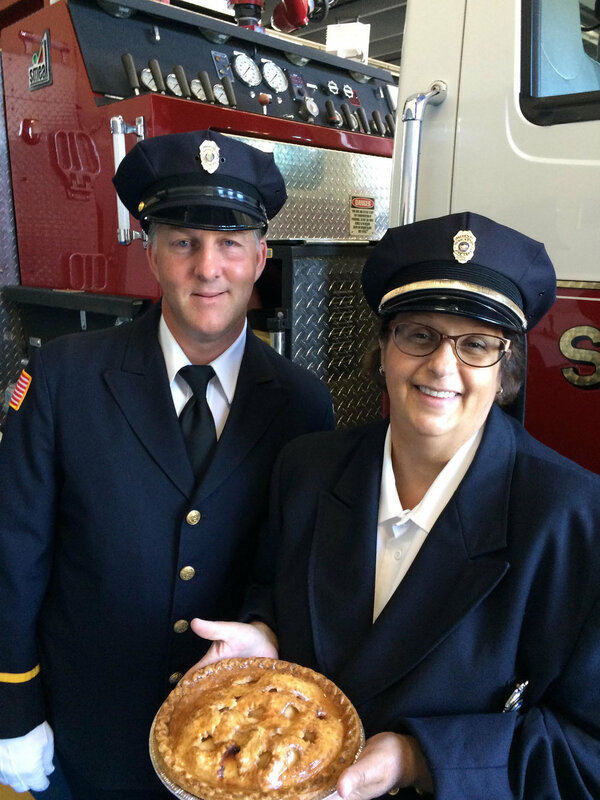 Bill Clark and Mary Crawford of the Bennington Fire Department invite the community to the Battle of the Pies event on August 18th as part of the Battle Day Celebrations. If you love baking or eating apple pie… then you are in for a treat! As part of this year’s Battle of Bennington celebrations, the Bennington Fire Department and the Daughters of the American Revolution (Ormsby Chapter) with support from the Bennington Regional Chamber of Commerce have joined forces to present the inaugural “Battle of the Pies.” This baking contest is both an opportunity to test your pie-making skills and compete to win a cash prize, or simply an opportunity for you to eat apple pie to your heart’s content. To register to compete in the baking contest, go to bennington.com/battleday and scroll to the bottom of the page to download your pie entry form. A $5 donation is requested, with all proceeds to benefit the Bennington Fire Department and the Daughters of the American Revolution, Ormsby Chapter. The registration deadline is August 15. The Battle of the Pies will be held at 423 Main Street (next to the Bennington Banner office) on Saturday August 18th. Bring your pies between 3:30 and 4:30 pm, with judging to start promptly at 5:00 pm. After each pie is judged, pie slices will be available for sale, with your choice of milk, ice cream, or cheddar cheese if you so choose! The Battle of the Pies continues the next day with the pie contest winners marching in the parade if they wish to, and pie slices being sold at that same location from 11 am to 3 pm, or until the pie runs out. A Bennington Battle History Center will also be set up at the Battle of the Pies during Saturday’s event. A number of information stations about the battle will be set up and the assistant director of the Bennington Battlefield David Pitlyk and Battlefield Interpreter Bob Hoar will be on hand to discuss the Battle and answer questions with interested folks. If you would like additional information or would like to sponsor this event, contact Jonah Spivak at jonah@sover.net or Mary Crawford at bennfiresec@live.com.